Marriage Is The Unity Of Two Souls! Make This Sacred Moment Beautiful With All The Unique Wedding Accessories, Personalized Unity Candles, Swarovski Crystal Unity Candles, Personalized Glass Wedding Card Holder Boxes, Memorial Candles, Personalized Pen Wedding Favors, Groomsmen Gifts, Bridesmaid Gifts, Flower Girl Gifts, Ring Bearer Gifts & Much More! Every bride dreams of her wedding day! Make that beautiful, romantic wedding come true with quality bridal products and caring service at low prices from Weddings Are Fun! Explore our website and find wedding tips and inexpensive bridal products to help make your wedding affordable, so you can stay within your budget and still have that beautiful wedding that you dreamed about! Find Bridal Shoes and Cheap and Unique Favors For Weddings, Personalized Wedding Favors, Personalized Wedding Candles, Wedding Unity Candles, Personalized Pen Wedding Favors, Glass Wedding Card Boxes or Candle Wedding Favors at a low-cost! We have essentials for weddings, wedding receptions and bridal showers to help celebrate your joyous occasion! We have the inexpensive solutions you need to make your wedding day fun and romantic! The Best Value, Fast Shipping And Low Price Guarantee. 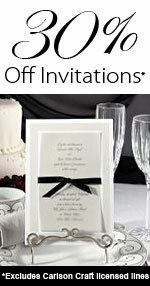 We will help you save money on our discount wedding favors, and on all of the special touches for your wedding! We sell beautiful keepsakes, wedding accessories, personalized wedding favors and wedding party gifts at the lowest possible discount prices and we will get your order shipped quickly! Remember, bridal showers are a special part of wedding plans and the Maid of Honor or any family member can host one to honor the bride and groom. We love to serve you with the highest level of trust and integrity. We are an authorized retailer of quality bridal accessories including Kate Aspen wedding favors which are unique, creative and cheap wedding favors! We will be glad to consult with you about all of our products to help you get just the right product and the best value for your wedding. Thank you for shopping at Weddings Are Fun and letting us share in this wonderful, joyous occasion in your life! May you live happily ever after! Order Online Nationwide, 24 Hours a Day, 7 Days a Week, 365 Days a Year! Free Shipping on Orders of $300 or more (in the 48 continental states). We Provide A 100% Satisfaction & Low Price Guarantee! See our info page for details. Member of the Better Business Bureau and the Association For Wedding Professionals International.